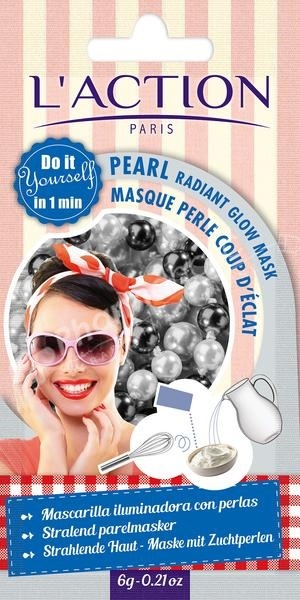 The Pearl Radiant Glow Mask is enriched with precious marine ingredients including real cultured Pearls. The mask helps to restore your skin’s natural complexion, producing a healthy pearly glow. Mix the sachet of powder with water to make your own mask. A unique, quick and fun way to tone your face, and leave your skin radiant and glowing. • Pearl - made from pure cultured pearls, pearl powder contains a combination of marine minerals that help restore the skin’s natural tone and brightness. • Chitosan - a marine alternative to collagen, it improves skin elasticity and smoothes out wrinkles. Instructions: Mix the sachet of powder with 2 or 3 tablespoons of water in a bowl until you obtain a creamy lotion. Apply the mask, leave for 10 minutes and rinse.